1. Preheat the oven to 200°C, gas mark 6. Mix all the ingredients together, including the oil from the artichokes, and season. 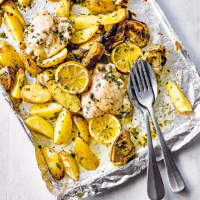 Spread everything out evenly on a large foil-lined baking tin. 2. Roast for 30-35 minutes, until the potatoes are soft and the chicken is golden, the juices run clear and there is no more pink meat. 3. Press the roasted lemon slices with the back of a spoon to release their juice before serving.